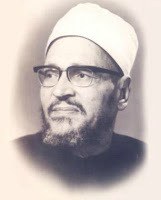 One of those who knew Guénon in Cairo was Abd al-Halim Mahmud (1910-78), who from 1973 until his death was Shaykh al-Azhar, the senior position in Egypt's official Islamic hierarchy. Abd al-Halim did a PhD in Paris, spoke French, and became friends with a number of French intellectuals in Cairo. The nature of the relationship between Guénon and Abd al-Halim has been discussed before, and is discussed again in a new book on Abd al-Halim and the media by Hatsuki Aishima, Public Culture and Islam in Modern Egypt: Media, Intellectuals and Society (London: I. B. Tauris, 2016). Aishima disagrees with the view of Abd al-Halim as the intellectual follower of Guénon, pointing out that Abd al-Halim was a public intellectual with an agenda of his own, and referred to Guénon to support that agenda--the critique of Western modernity, and the promotion of the role that Sufism could play in modern Egypt. Abd al-Halim's agenda was certainly compatible with Guénon's, as Aishima's book shows, but far from identical.